Here’s another Quick stop to hear from the Master Chef. 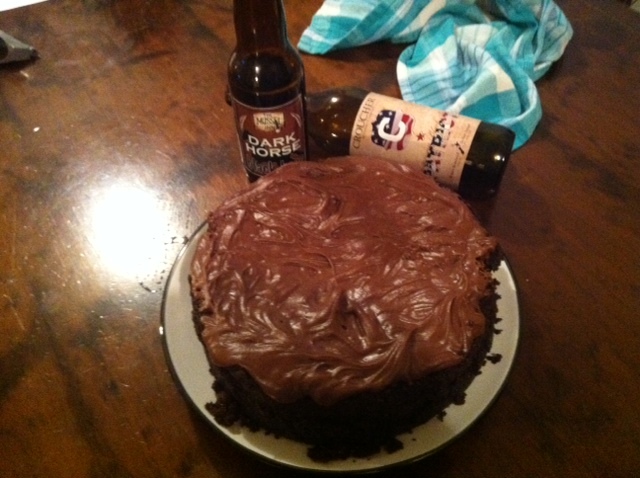 After reading about it in the Weekend Herald everyone must have their mouth ready for a piece of the moist chocolate cake made with Croucher Patriot, an American Black Ale full of American amarillo and simcoe hops, and topped with icing made using Dark Horse by Onekaka’s Mussel Inn. The Croucher Patriot has to be my all time favourite beer – of all time. Its not what you would imagine in a beer. Pouring into a glass you would think it was a dark looking porter or a light stout but if you did a blind taste test the taste blows your mind, with a super smooth hop taste. For those less inclined towards papers, here’s the link! Can you tell we’re a bit excited!? Sweet malty nose, smooth malt taste with a subtle peat finish. Very smooth drinking and tasty. As Matt had been a-travelling down New Plymouth way, he had most thoughtfully dropped by Mike’s Brewery on the way back and collected some brews to share with us all. In case you’ve not heard of them, Mike’s Brewery produce high-quality beer from Organic ingredients, in the small settlement of Urenui (that’s in the Taranaki, New Zealand). All of the beers they produce carry the Bio-Gro “Certified Organic” mark. Certified Organic is an assurance that the ingredients have not been in contact with any synthetic chemicals such as pesticides, herbicides or fertilizers, and that the farming is sustainably managed for the long-term. Organic growing tends to be more labour intensive for these reasons, which often drives costs up compared with traditional farming – however it does mean that you’re not ingesting synthetic chemicals along with your beer, and that conditions are maintained for future generations. Both of these are good things, I think. So what arrived at our table this Wednesday night were two infused porters for our delectation – one with Whisky and one with Coffee – and both certified organic! Read on to see what we all thought.